Income Tax registered a thumping 5-0 victory over Byculla United in the Mumbai District Football Association ( MDFA) , Super Division match held on Thursday evening at St Xavier’s ground Parel. 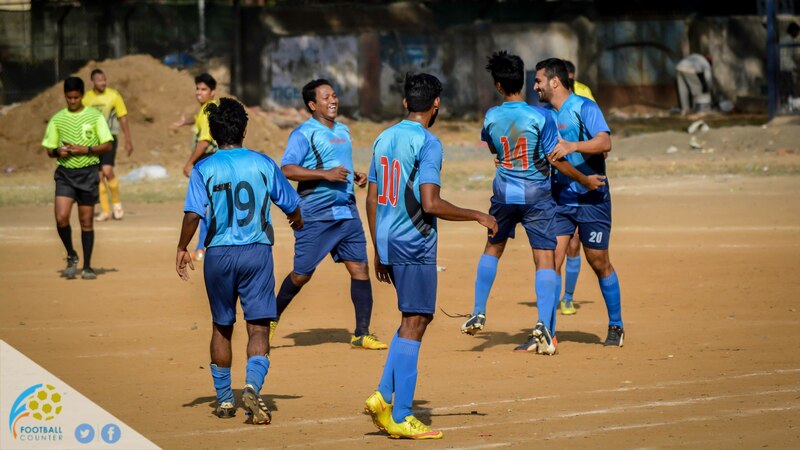 Income Tax faced Byculla United in their Group D game on thursday. Byculla United drew their previous game whereas Income Tax succumbed to a 3-1 defeat, a win today was much needed to take a step forward in qualifying for the playoffs from their group. The first half entirely belonged to the Income Tax team who were in a mood for scoring goals. A half that saw them runover Byculla United by 4-0. Although the scoreline would have been much worse, it remained 4-0 at halftime. Number 8 Prathamesh Porwal opened the scoring the 18th minute when he made an excellent run from the left latching on to a through ball, calmly slotting it past the keeper in the left bottom corner. A much needed lead which would turn out to be a goalfest later. Few minutes later number 14 Monish Panchal doubled their lead scoring a beauty cutting in from the left and shooting from the edge of the box into the top right corner. Byculla United’s right hand side looked in utter dismay as they watched a second goal go in from their right hand side. Any chance of a consolation goal from Byculla was denied by an Income Tax side which was in no mood to concede. As seen on the coach’s face, this Income Tax side managed to put their defeat behind,scoring five very good goals to register a win. Byculla United would be keen to assess this game as they would be eager to put this behind them.